Last month I spent just over two weeks in Abidjan for the happy arrival of our new son Joshua. I hope to pen a few blog posts from the visit, but as a start, let me try and ramble a little on my old neighbourhood: Cocody-Danga. For me the area is little discussed but has some hidden charms that I enjoyed seeing again during the several days that we were encamped at the PISAM hospital for the birth. I’m not quite sure on the geographic extent of Cocody-Danga, but at a guess I would say that it runs from the PISAM / Nestle HQ in the west, bordered in its lower half by the Corniche road that runs up to St John junction, and then up Boulevard Latrille past RTI. Now, I’m not sure after that, but personally I would include the area from Lycee Technique, through the teachers’ residential area and up to the Hotel Palm Club. In the main, it’s upmarket residential villas, with for instance the Swiss and Italian ambassadors’ official residences, though there are a few institutions – notably the PISAM hospital, the Providence hospital, Lycee Technique, Cite rouge (student residential block) and the Angolan embassy. Hidden largely from sight, there was also a smallish slum along a drainage channel – this was cleared by bulldozers a couple of years back and I didn’t get to see if people have returned (probable I suspect). I lived in the area from my arrival in November 2007 up to December 2010 when we moved into our home in Riviera. From the journalist I replaced, I inherited a very pleasant two bedroom apartment at the bottom of Rue Lepic (home to the RDR political party). There was a very large swimming pool (once used by Meiway for a video) and a tennis court. The block was owned by the family of a former, now deceased, mayor of Abidjan (Emmanuel Djibo if I’m not mistaken) who’s huge home was next-door, though since his death the family hadn’t found a new use for it (so often the case for the families of deceased ‘barons’ who’ve set-up unsustainably large show homes). For me the area is something of a hidden gem in Abidjan. Firstly, it’s the very first bit of Cocody you get to when coming from the Plateau business district, which makes it well placed if you happen to be working in the centre of town. On top of this, it’s also relatively congestion free because most traffic stays on the main Corniche Road (or on the more northerly Boulevard Mitterrand) and heads straight past. To access the area from the west, you need to come off the highway at Carrefour Indennie and head up the hill past Nestle. Despite being so close to Plateau, it has a quiet residential feel, with some very pleasant roads. My favourite is the tree-lined Rue Cannebiere which houses the Italian embassy. If you peep over the walls on this road, you’ll find some beautiful colonial and independence era homes (in a city in which I’d rarely use the word ‘beautiful’ and ‘architecture’). Some of these homes have spectacular views over the Cocody Bay to Plateau. On my recent return, it was noticeable that the roads have been repaved in several areas (particularly around the gently bending Rue des Jasmins). But perhaps the biggest development is the arrival of large Lebanese financed luxury apartment blocks (see photo) around the Pharmacie Lycee Technique area. Some of these were underway in the Gbagbo era, but progress seems to have really accelerated, and with accompanying institutions like banks following in their wake. I recall seeing some of these apartments for sale at 170 million CFA ($290,000) a piece, which seems extremely high for a flat without any amenities like a garden or pool. This gets me to a final point. Perhaps the area’s biggest drawback has always been the near total absence of anywhere to eat. There was supposedly a place on the upper floor of the small commercial area around the Pharmice Lycee Technique but this was rumoured to have just closed before my arrival in 2007. You can get chwarmas at the Lebanese butcher in the complex, but it never looked particularly hygienic. This time around, I had a lunchtime snack (chicken wrap and chips) in a brand new place that’s right on the junction photographed above (behind the Vlisco billboard). In the future, I suspect the ground level of some of these apartment blocks will have eating options. Otherwise, I think the assumption is that you’ll head into Cocody St. John or Plateau, which admittedly are just next door. 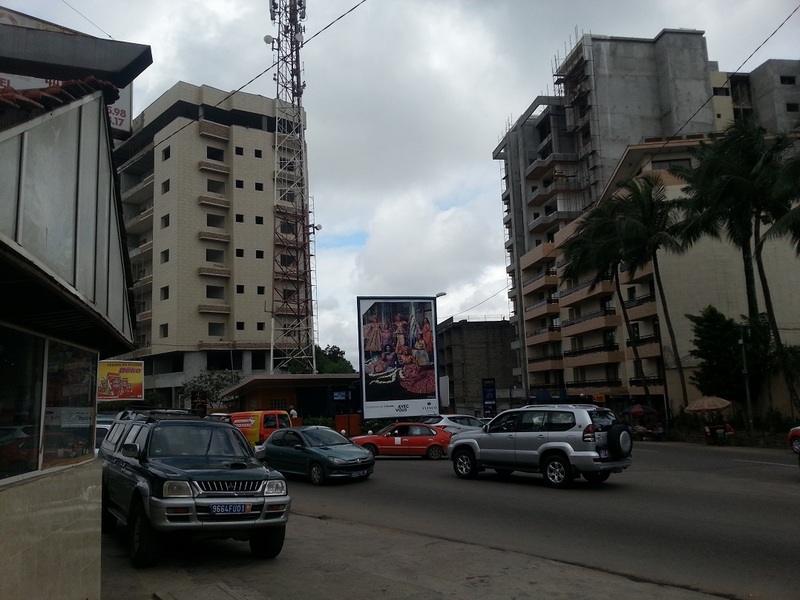 This entry was posted in Economics and tagged Abidjan, Cocody, Danga, economy, living, residential. Bookmark the permalink.